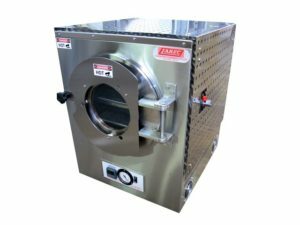 Labec Vacuum Oven is manufactured in Australia with high quality stainless steel for easy maintenance and excellent durability. Used where the entire heat-treating process is to take place under vacuum or a precisely controlled atmospheres. An inconel element inside the vacuum chamber either wall or centre mounted with valves for the vacuum, bleed and purge of the oven chamber. Available in cylindrical or square chamber up to 100 litres capacity and temperature ranges of Ambient +5°C to 400°C, (See model specifications). Labec offer a Digital Vacuum Oven that is extremely accurate and reliable. The large flat heater embeded on the right and left side wall and bed provides excellent temperature uniformity and quick heating time. The oven features a PID controller and digital display. Silicon door packing and positive door latch ensures a tight seal. The vacuum and purge valve are located on top of the oven for easy access. Labec Precise Digital Vacuum Drying Oven is suitable for drying and heating powder articles, as well as disinfecting and sterilising of glass containers. With characteristics of short warming up times, low pollution and non destructive drying, it is widely used in the field of medicine, food, light industry, chemistry, agriculture, environmental protection and experiment.